Creates a sense of equality, connection and belonging to the universe to nature and to all creatures with no regard to race, religion and gender. Based on a group of energetic formations of crop circle found in various places in the world. This one is based on crop circle found in England in 2005 by the artist. 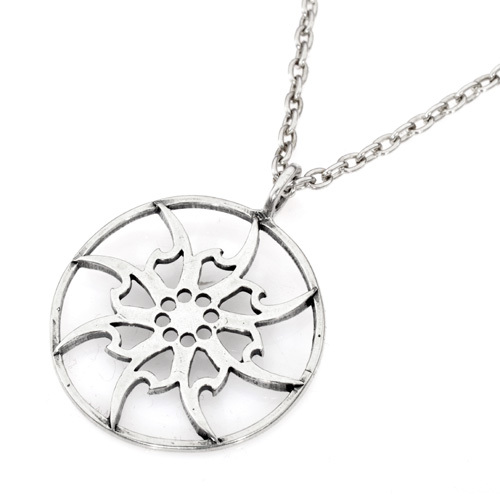 Crop circles has a special energy, and by adding the power of the kabala, unique high powered 925 silver pendants have been created.+This exquisite necklace is in the shape of an exotic flower, which is based on a crop circle found in England in 2005. It’s made of silver, as according to the Kabalah, silver is the perfect metal to enhance energies. The design is believed to create a sense of equality, connection and belonging to the universe, to nature and to all creatures of the earth with no regard to race, religion and gender. The circle surrounding the flower shows that everyone is all together in one world. 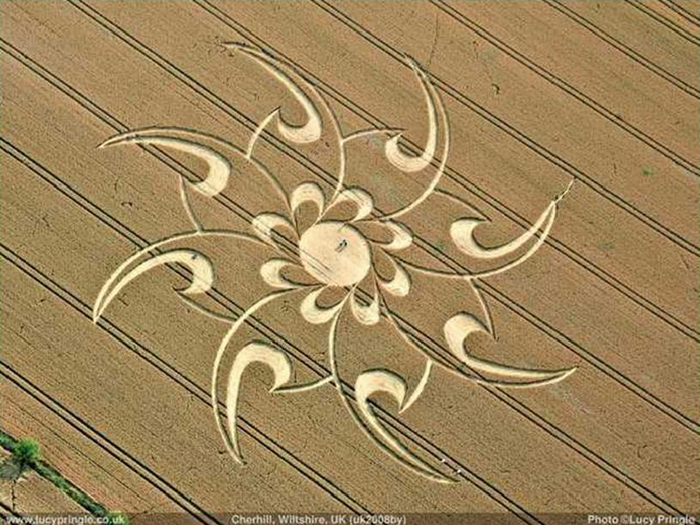 According to legend, crop circles have unknown origins, and therefore they connected to the appearance of UFOs. However, crop circles are also known to be spiritual, and the Israeli artist who thought of this line of Kabala jewelry related to that idea, while adding Kabalistic meaning as well. Jewish mysticism is studied through the Kabala (also written Kaballah or Kabbala). Started hundreds of years ago, mystics believe the world has power beyond the physical, and that every earthly object had meaning. The Kabala (commonly misspelled Cabala or Caballa) is not commonly taught because of its otherworldly content, yet its ideas have penetrated our lives in many ways. The artist who created this piece of Judaica jewelry went by his meaning and understanding of the Kabala to make this unique necklace. Kabbalah jewelry and amulets are known for their abilities to bring protection, success, good luck, security, wealth, and health to their wearers. Each piece has its own unique mystical powers and special meaning, allowing you to select the one that best meets the needs of the wearer.+Kabbalah jewelry and amulets make excellent gifts for friends and family. When selecting the Kabbalah symbol that addresses the unique needs of a friend or loved, you are showing them that you really care about their well being with this thoughtful gift. The literal translation of the term Kabbalah is 'receiving.' This refers to receiving the hidden mystical truths behind Jewish thinking and Jewish traditions.According to Kabbalistic tradition, knowledge of Kabbalah was transmitted orally by the Patriarchs and sages. Initially Kabbalah was widely studied by pious Jews who wished to understand the mystical aspects of the connection between man and G-d. Eventually the sages feared that the secrets of Jewish mysticism may fall into the wrong hands during foreign conquests or may be misinterpreted by unknowledgeable students. It was therefore decided to reserve the study of Kabbalah to pious and knowledgeable students over the age of 40. This has been the case for over 2000 years until recently when a renewed interest suddenly appeared. Now Kabbalah is being studied by many people all over the world including famous celebrities. Jewish mysticism has begun to attract the attention of the masses as they search for hidden wisdom and meaning in turbulent times. With these unique jewelry designs, we provide the opportunity to connect with the ancient powers of Jewish mysticism.